This is Fluke. 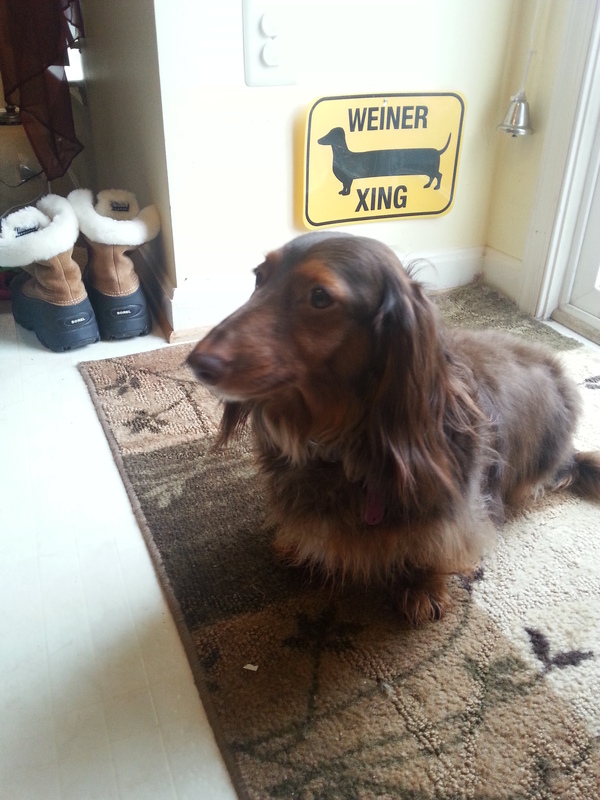 He is a six and a half year old chocolate, long-haired dachshund. We adopted him last week. His family didn’t have time or money to give him all he deserves, but they loved him enough to want him in a good home. They know that living with me, he will be completely loved and spoiled. I was once told by a fellow writer that if they died, they wanted to be reincarnated as one of my dogs. I guess I go overboard. Fluke spent the last two years or so receiving manna from heaven. i.e. food from the baby. So, he is fat. He barks at every dog he sees or hears. He cries. I think he has anxiety issues. The rehab Fluke program will consist of 1. Walking, good for me too. 2. Socialization – obedience class will help. 3. Consistency – and if he doesn’t calm down, the vet and I are discussing doggie downers. My short story A Tail of Two Doxies will be out soon. It’s a rescue story for two abused dachshunds, Skeeterville style. Of course there’s a happy ending. I wouldn’t cheat my readers out of that! It’s a taste of Skeeterville between the novellas. I hope you enjoy it. Right now, I have two doxies at my feet. Sleeping, not crying. Carmen has been a gem and accepted him like a brother. I’m happy. Posted by TeresaQuill on April 12, 2015 in Uncategorized.